Your software has bugs. Sorry, mine does too. Doesn’t matter how much you’ve tested it or how much QA has tested it, some bugs will get through. And unless you’re NASA, you probably can’t afford to test your software enough anyway. That means your users will be finding bugs for you. They will discover that your site doesn’t work on IE 8.2. They clicked a button and a blank screen came up. Where is that feature you promised? WHY IS THIS NOT WORKING?! As you know from personal experience, users don’t enjoy finding bugs. Now you have buggy software and unhappy users. What are you going to do about it? Luckily, in 1970 the economist Albert O. Hirschman came up with an answer to that question. Exiting, i.e. giving up on your product. Someone who has given up on your software isn’t likely to tell you about their issues. And someone who cares enough to file a bug is less likely to switch away from your software. Finally, loyal users will stick around and use their voice when otherwise they would choose exit. Now, your software has no purpose without users. So chances are you want to keep them from leaving (though perhaps you’re better off without some of them - see item #2). And here’s the thing: there’s only two choices, voice or exit. If you can convince your users to use their voice to complain, and they feel heard, your users are going to stick around. Now at this point you might be thinking, “Itamar, why are you telling me obvious things? Of course users will stick around if we fix their bugs.” But that’s not how you keep users around. You keep users around by allowing them to express their voice, by making sure they feel heard. Sometimes you may not fix the bug, and still have satisfied users. And sometimes you may fix a bug and still fail at making them feel heard; better than not fixing the bug, but you can do better. They can report bugs with as little effort as possible. They hear back from you. If you choose to fix the bug, you can actually figure out the problem from their bug report. The bug fix actually gets delivered to them. Let’s go through these requirements one by one. Once your users notice a problem you want them to communicate it to you immediately. This will ensure they choose the path of voice and don’t contemplate exiting to your shiny competitor at the domain next door. To ensure bugs get reported quickly (or at all) you want to make it as easy as possible for the user to report the problem. Each additional step, e.g. creating an account in an issue tracker, means more users dropping out of the reporting process. And of course the page will give no indication of how or where you should report the problem if it reoccurs, and do the people who run this website even care about your problem? Make sure that’s not how you’re treating your users when an error occurs. So let’s say you include a link to the bug report page, and let’s say the user doesn’t have to jump through hoops and email verification to sign up and then fill out the 200 fields that JIRA or Bugzilla think are really important and would you like to tell us about your most common childhood nightmare from the following list? We’ll assume that bug reporting is easy to find and easy to fill it out, as it should be. But… you need some information from the user. Like, what version of the program they were using, the operating system and so on and so forth. And you do actually need that information. But the user just wants to get this over with, and every additional piece of information you ask for is likely to make them give up and go away. What to do? Here’s one solution: include it for them. 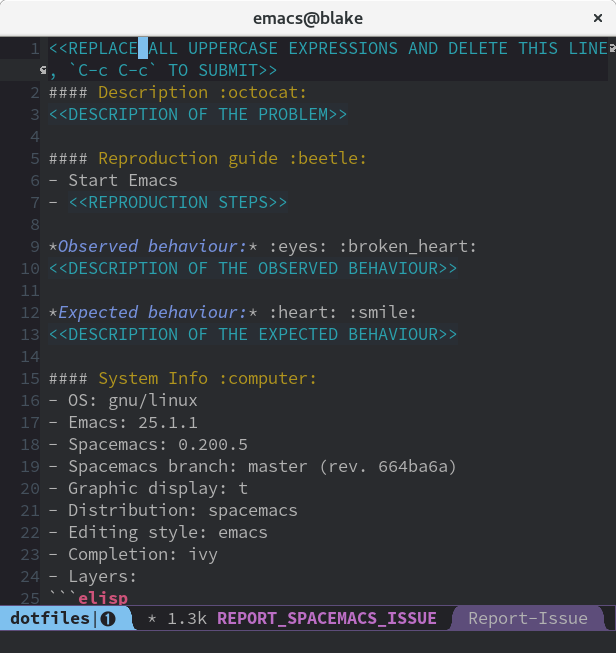 I’ve been using the rather excellent Spacemacs editor, and as usual when I use new software I had to report a bug. So it goes. Anyway, to report a bug in Spacemacs you just hit the bug reporting key combo. You get a bug reporting page. In your editor. And it’s filled in the Spacemacs version and the Emacs version and all the configuration you made. And then you close the buffer and it pre-populates a new GitHub issue with all this information and you hit Submit and you’re done. This is pretty awesome. No need to find the right web page or copy down every single configuration and environmental parameter to report a bug: just run the error-reporting command. Also, notice that this is a lot better than automatic crash reporting. I got to participate and explain the bits that were important to me, it’s not the “yeah we reported the crash info and let’s be honest you don’t really believe anyone looks at these do you?”-vibe that one gets from certain software. Ask for the user’s feedback in the terminal, or within the context of the web page, and then file the bug report for them. Gather as much information as you can automatically and include it in the bug report, so the user only has to report the part they care about. But for a commercial product I am paying for I want to know that my problem has been heard. And sometimes the answer might be “sorry, we’re not going to fix that this quarter.” And that’s OK, at least I know where I stand. But silence is not OK. Respond to your bug reports, and tell your users what you’re doing about it. And no, an automated response is not good enough. If you’ve decided to fix the bug you can now proceed to do so… if you can figure out what the actual problem is. If diagnosing problems is impossible, or even just too expensive, you’re not going to do fix the problem. And that means your users will continue to be affected by the bug. I clicked Save, and your program crashed and deleted a day’s worth of my hopes and dreams. This is pretty bad: an unhappy user, and as is often the case the user simply doesn’t have the information you need to figure out what’s going on. Even if the bug report is useful it can often be hard to reproduce the problem. Testing happens in controlled environments, which makes investigation and reproduction easier. Real-world use happens out in the wild, so good luck reproducing that crash. Remember how we talked about automatically including as much information as possible in the bug report? You did that, right? And included all the relevant logs? If you didn’t, now’s the time to think about it: try to ensure that logs, core dumps, and so on and so forth will always be available for bug reports. And try to automate submitting them as much as possible, while still giving the user the ability to report their specific take on the problem. So now you’ve diagnosed and fixed your bug: problem solved! Or rather, problem almost solved. If the user hasn’t gotten the bug fix all this work has been a waste of time. Your users will feel heard, and choose voice over exit. You will get the occasional useful bug report, allowing you to improve your product. All your users will quickly benefit from those improvements. There is more to be done, of course: many bugs can and should be caught in advance. And many users will never tell you their problems unless you ask. But it’s a good start at making your users happy and loyal, even when they encounter the occasional bug.